Browse for belts by vehicle make and model. We only sell drive belts made in the USA, Germany, or Japan. 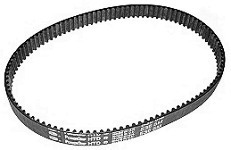 We stock over 140 different sizes of high quality HTD drive belts for electric scooters. Belt sizes which are not listed above can be special ordered by telephone. These numbers and letters may be placed together (5355M15), or they may have dashes and or forward slashes between them (535-5M/15), or they may have the first 5 digits only (535-5M or 5M535). Other variations are also possible depending upon the belt manufacturer. Wrap a small length of insulated electrical wire firmly around the scooters drive belt cogs positioned in place where the drive belt would be. Now mark the wires with a pen where they intersect. The length between the pen marks indicates the approximate belt length that is needed. The sprockets peak to peak teeth distance and the sprockets teeth width measurements will also need to be measured. 3mm Teeth: The distance from peak to peak of two adjacent belt teeth is 3mm or slightly under 1/8" apart. 5mm Teeth: The distance from peak to peak of two adjacent belt teeth is 5mm or slightly over 3/16" apart. The conversion calculator above will calculate this formula.